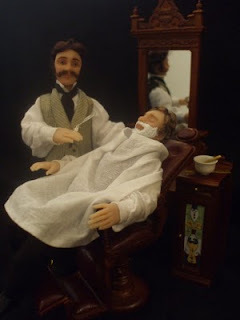 This is a new 12th scale Victorian barber and customer. Poseable one of a kind dolls sculpted from polymer clay and dressed in hand sewn clothing. The dolls come with accessories shown and will be available at Spring Miniatura from Bellabelle Dolls IGMA Artisan Julie Campbell.